If you’ve ever had to come up with a name for a group, a company, a project, it can be one of the most daunting tasks. It’s important to get it right! And when it comes to a company, not only does it have to be right…but also not already taken. Lucky for us, Savvy Cooperative was available. Savvy: Because we believe patients and loved ones are experts on their experiences. Cooperative: Because we are a co-op! A cooperative is jointly-owned by its members, in our case — patients and loved ones. Not everyone identifies as a “patient”. I was speaking to someone earlier this week about the terminology and whether people consider themselves patients, people with disabilities, consumers, etc. When talking about her mother’s health experiences, she said: “You know what my mom likes to be called? ‘Carol’.” Of course! We are real people first. We want to be inclusive of both “patients” and their support system, who have unique and valuable perspectives to share about helping to manage someone’s health. Loved ones/caregivers, you’re welcome here! We believe health experiences impact all areas of someone’s life, not just in the health system. We want to make sure all professionals know they are welcome to connect with our co-op! Whether designing kitchen tools, clothing lines, or pharmaceuticals, our doors are open. 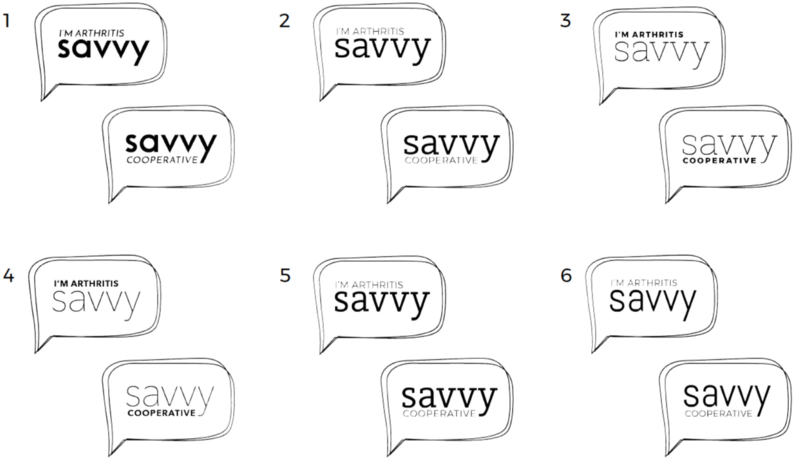 We landed on the talk bubble, wanting to play up the “I’m ____ Savvy”. Then it was about getting the font right. Something just felt off to me. We tried all sorts of versions. So I wrote it out quickly. And she turned that into a logo! I felt I owed the co-op a bit more patience and finesse than scribbling it down, so the next morning I got up (enjoy my snazzy bicycle pajamas) and must have written it out over 100 times. 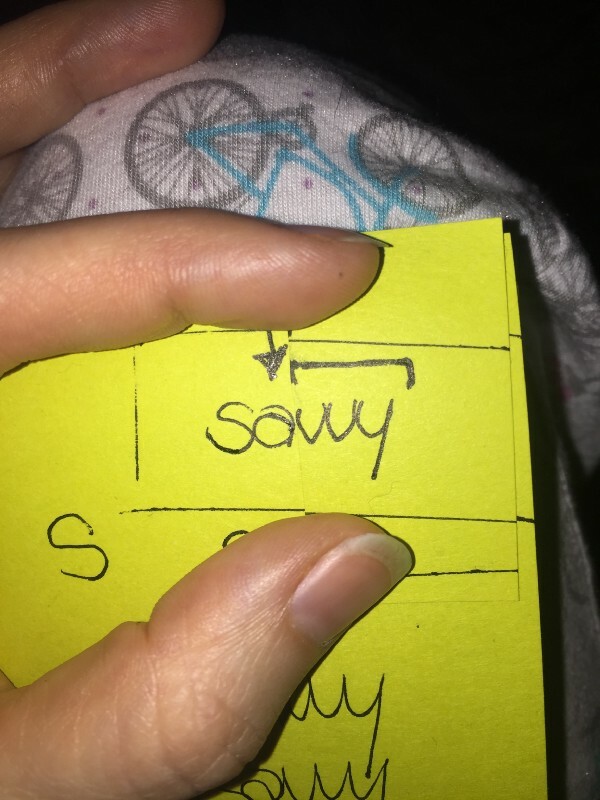 My husband found me in the living room surrounded by Post-Its. 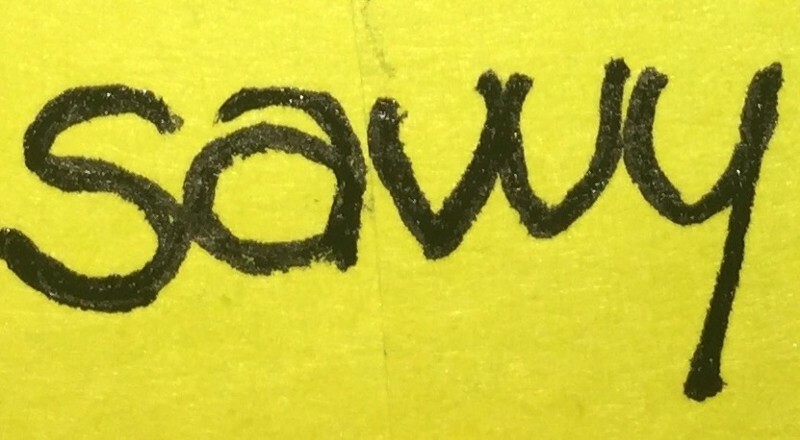 I wanted to get each letter just right, and wound up liking my “sa” from one try and “vvy” from another, so I cut the papers and stuck them together. It turned out that the “VV”s looked too much like a “W” when they were slightly rounded, so we went with straight Vs, and that’s how the logo was born! Using someone’s real handwriting felt like it really fit our brand. At Savvy, we strive to give people a platform to — in their own words — share their real, lived experiences. So it felt right to have “savvy” be just as real life. Whatever you’re savvy about, you do you. So now you know how we landed on the logo! Bonus Features and Calls To Action! 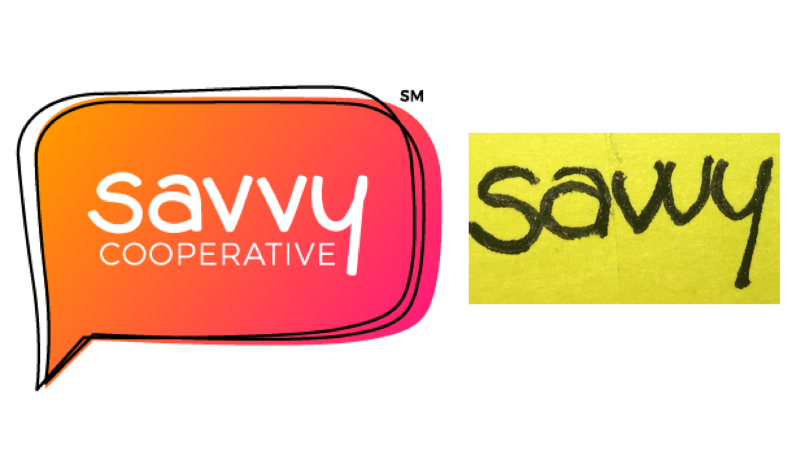 And in an effort to keep this personal and community-driven, we are circulating a survey asking people to help us develop Savvy’s Core Values. Please take a moment to help us craft them! Meet Che, an activist by name, a Savvy mascot because we love cat photos. And if you want to show off what you’re savvy about, check out our new swag! 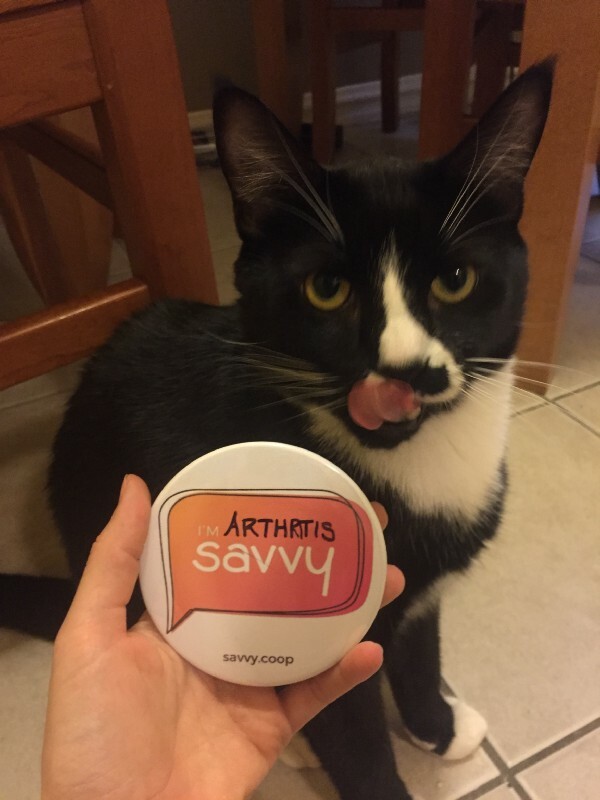 (Sorry, cat-approved buttons are not available here, but if you really want a first edition button, we’ve still got some! Email hello@savvy.coop).